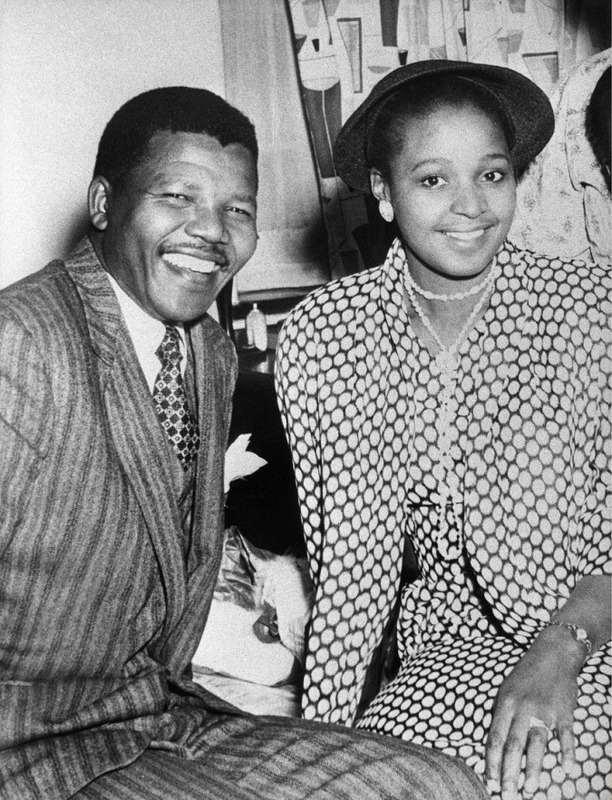 The passing of Winnie Madikizela-Mandela has saddened the world. Messages of grief are pouring in, reflecting the esteem and respect she inspired in millions the world over. 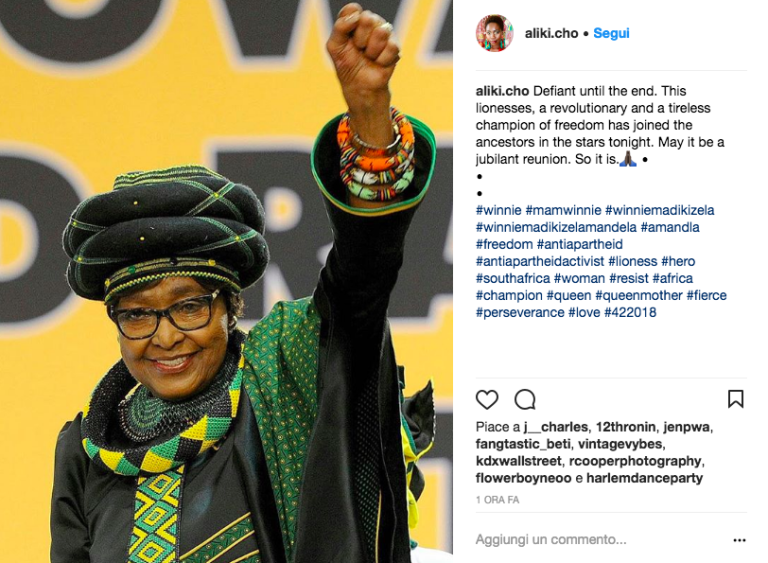 Ever the fearless activist and campaigner for racial equality and freedom, Winnie was also an icon of style, albeit an unlikely one, for some. Since meeting Nelson in 1957 aged 22, her entire life was spent in the spotlight and her fashion choices reflected her difficulties and the complicated balance she tried to keep between her public and private personas. 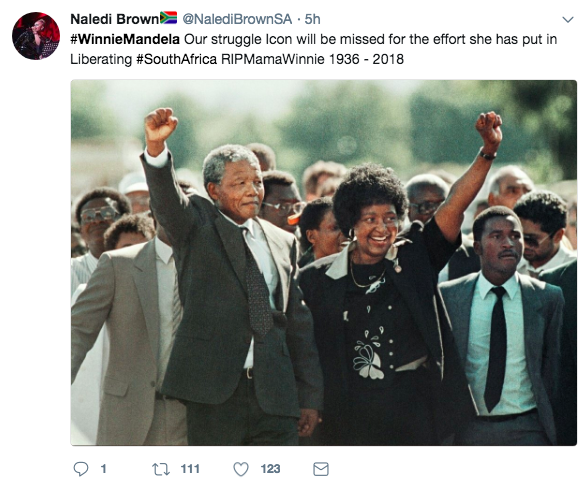 Winnie did not privilege a specific style, disclosing in an interview from 2016 that, in fact, she had “no particular style”. 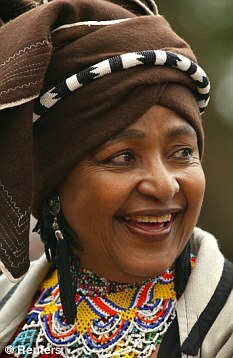 She rather chose to navigate many, referencing a variety of sources and cultures, dressing the part on occasion and always leaving space to let her personality shine, whether by channeling the Xhosa, Zulu and Ndebele heritages, experimenting with color, or donning extravagant items and accessories. 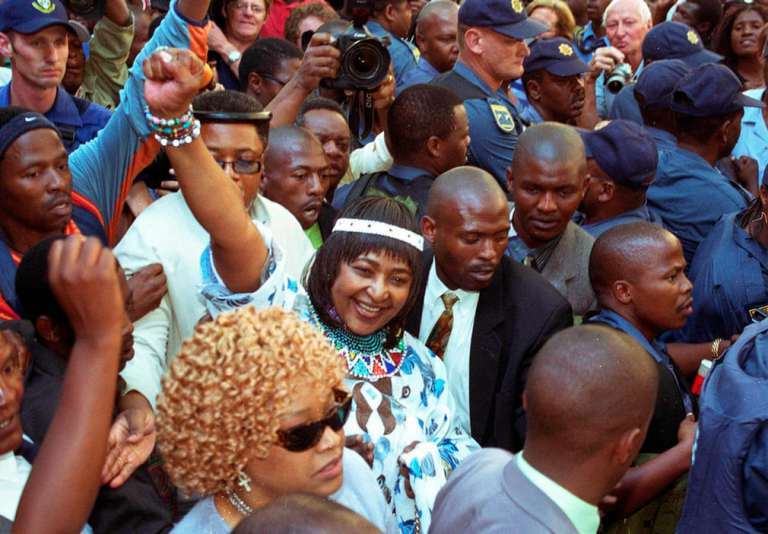 At the height of the freedom struggle and through the years of Mandela’s incarceration Winnie chose outfits that unequivocally conveyed her support of anti-apartheid and black liberation. Since the fight concerned the right to self-representation, she sought to make herself the symbol and the vehicle of a new symbolism rooted in black empowerment, turning her outfits into an extension of her beliefs. 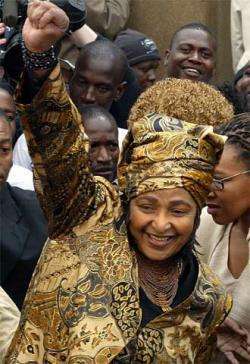 To that end Winnie would often appear in kaftans, turbans, as well as the traditional attire and accessories of the Xhosa, her people. 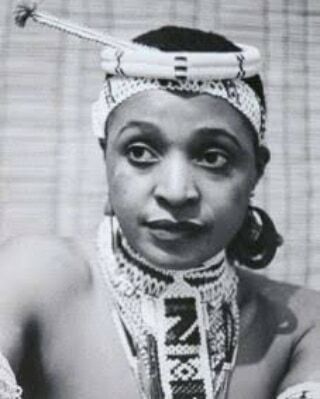 One such occasion was the Rivonia trial that took place in Pretoria in 1962, where she and her sister wore Xhosa regalia, only to be prohibited from doing it again after the first day of trial. 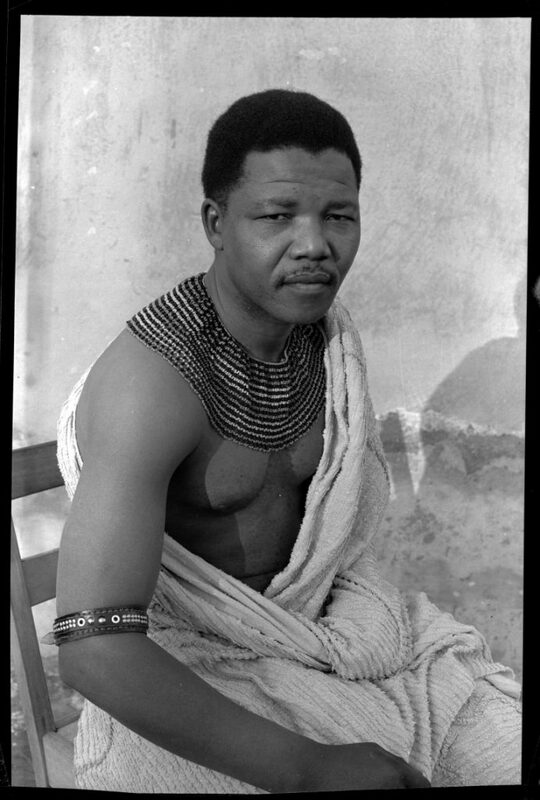 The pictures of that day complement those of Nelson Mandela who stood trial in a Thembu royal costume of beads and leopard skin, which he donned to establish a visual cue of the racial tensions that were tearing South Africa apart. 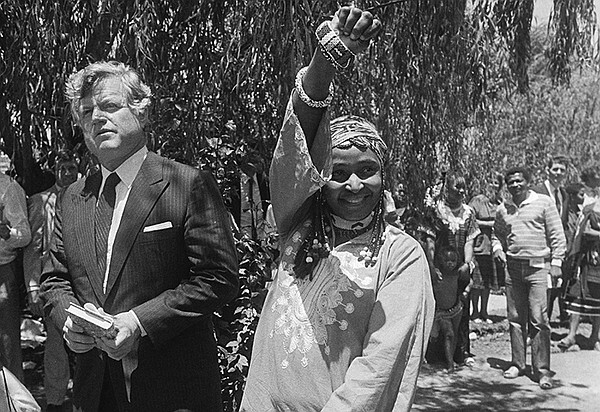 Winnie was especially fond of beadwork and wore it consistently throughout her life, most notably upon meeting Edward Kennedy in South Africa, himself involved in the civil rights movement. 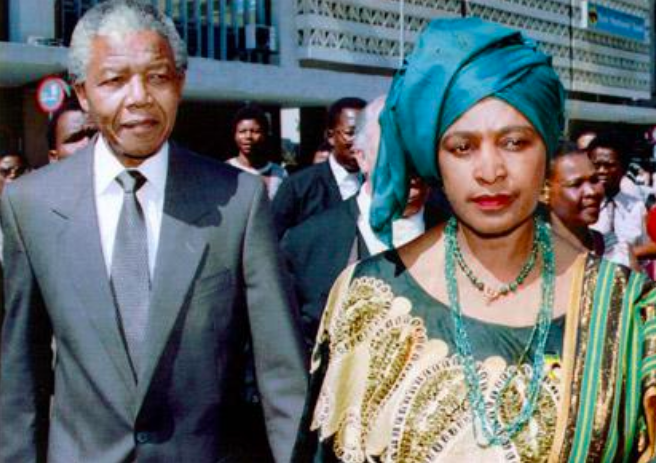 Winnie would continue to wear beads even after her husband’s release, when instead Mandela decided to avoid wearing it as a measure against ethnic divisions. The militant and culture-conscious get-ups also often included actual military gear accessoried with a beret. 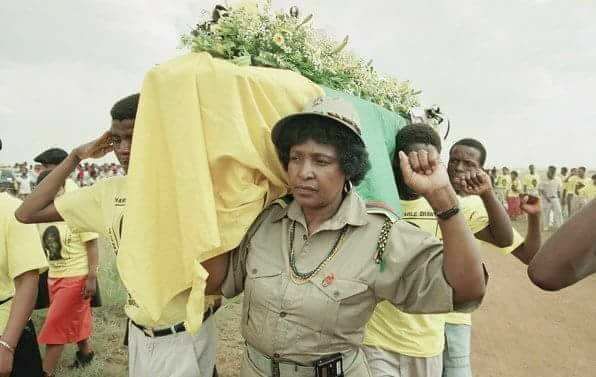 The uniform expressed Winnie’s total dedication to the cause and her disregard for formality: she literally wore her heart on her sleeve, projecting a non-conformist, more masculine and aggressive image. 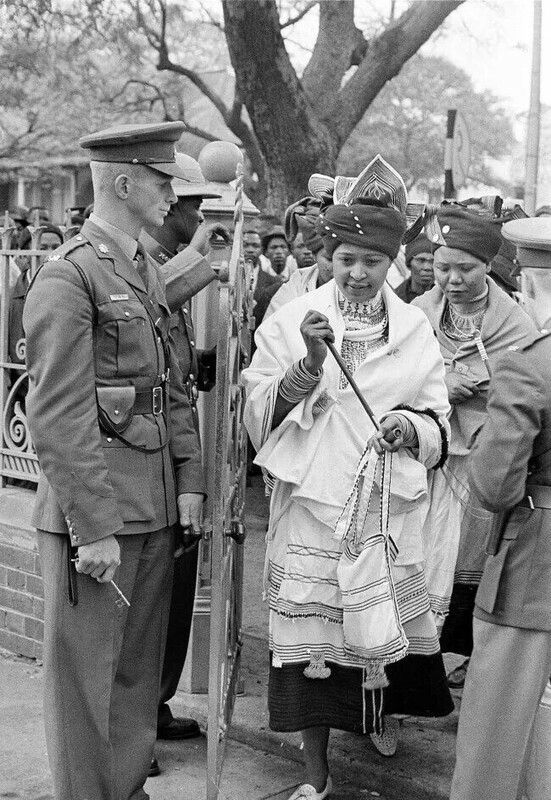 This style choice clashed with the early public image of the docile housewife dressed in demure and prim Western-style clothes and pearls, propelling her into the spotlight as an outcast and dangerous antagonist of the apartheid regime. 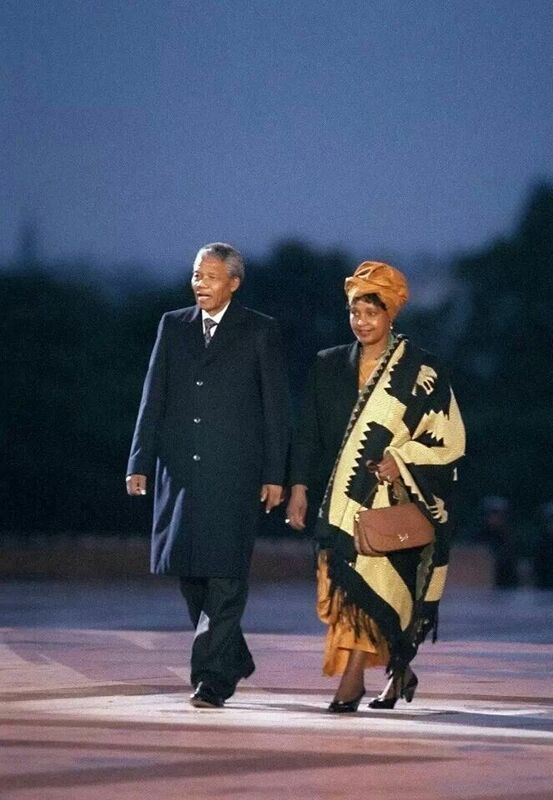 After Nelson’s release and when she became first lady, Winnie continued to make strong fashion statements, choosing outfits that outlined her figure, making her appear full and towering beside her husband. The accessories, fabric, color combinations, length of the gowns, embroidered boubous, separates and suits that she donned showed that she was determined not to stay in his shadow. In the end, Winnie never entirely surrendered herself to a fixed aesthetic model and this makes her sort of an elusive character to discuss. Robb Young writes on the BBC that her style choices “reinforced her enigmatic reputation”, that their indecipherability reflected a “opaque” reputation. 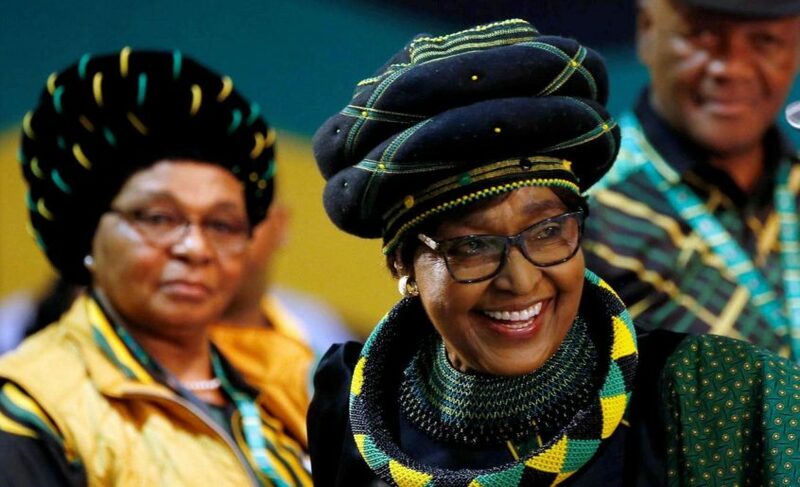 He also adds that in later years Winnie’s style choices conveyed nostalgia, as she wore get-ups that referenced the times when she “rubbed shoulders with … the power brokers of the era”. 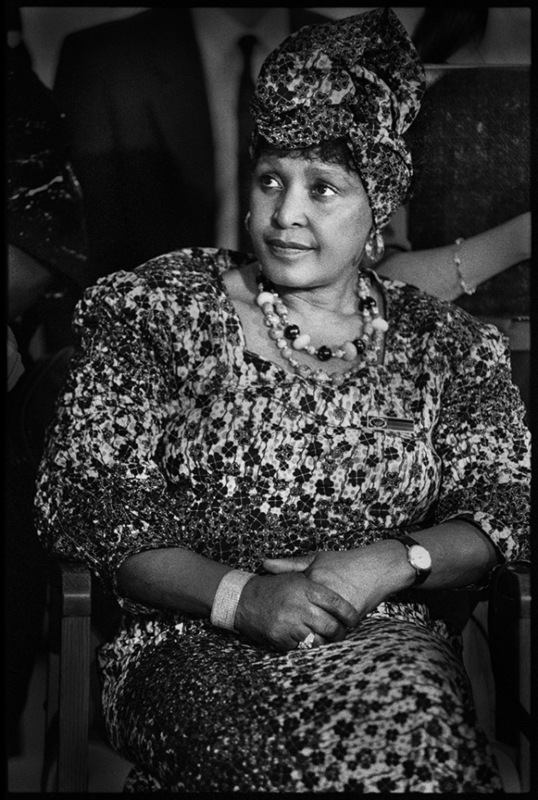 But Winnie was too conscious of the political meaning of her body to ignore fashion’s power to make a statement. I would rather say that her mercurial style reflected her difficulties of fitting into a pre-assigned role and constantly living in the shadow of someone else which she eventually ended up not seeing eye to eye with (to put it mildly). 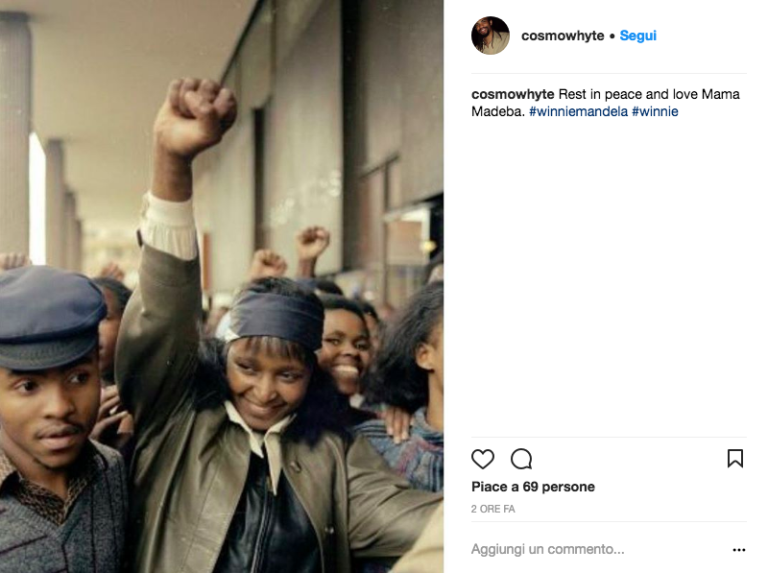 For those unfamiliar with Winnie’s unique style, a collection of old and more recent pictures is coming together on social media. 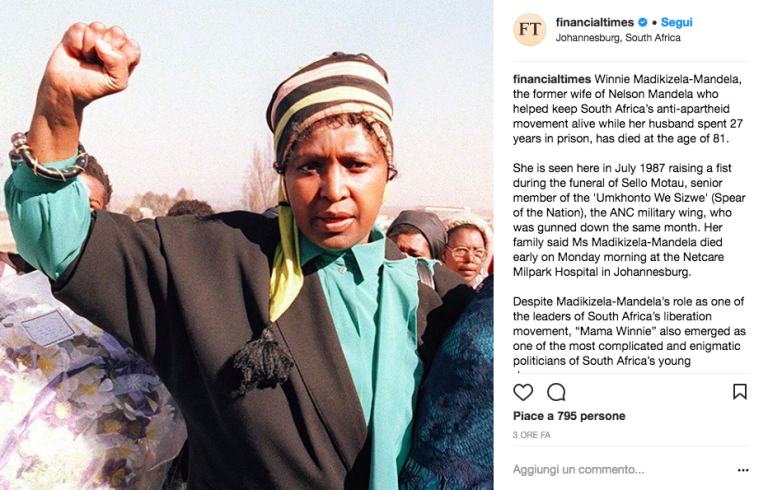 This “instant-gallery” is interesting because as it maps Winnie’s life and achievements, it also shows how she will be remembered. 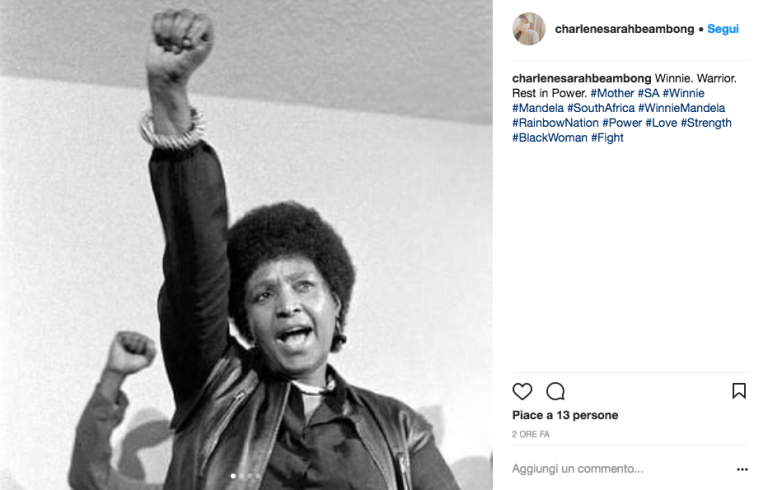 This pattern of collective memory is naturally consolidating around the image of the victorious fighter saluting the crowd, left fist raised high in the air. 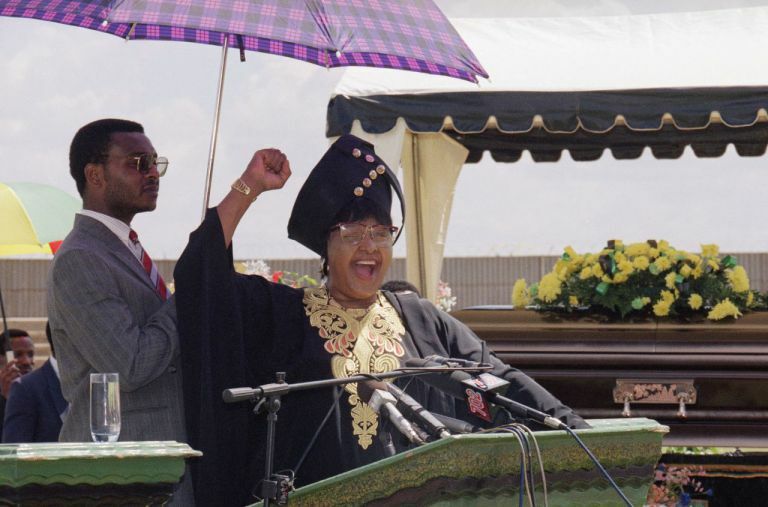 Winnie’s beliefs and action for change inspired a unique style that is hard to define, but that unequivocally marked her as a fashion-conscious militant. Her brand of fashion activism lives on in the political message of blockbuster Black Panther, as Ruth Carter, the film’s costume designer, says she looked at Winnie’s voluminous heritage headwear for the costumes of Queen Ramonda, played by Angela Basset.